Neck injuries in football can vary from the rare catastrophic event, to the much more frequent but less severe neck stinger. 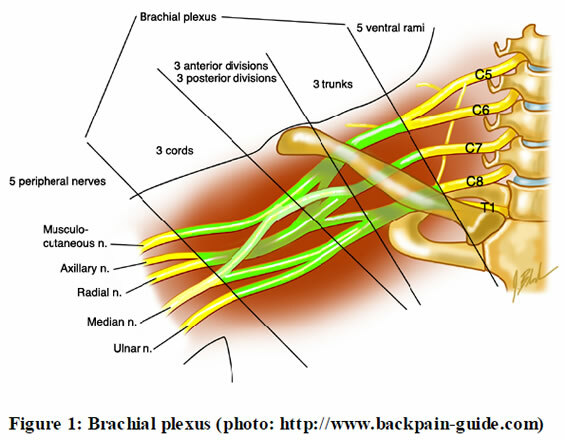 Specifically, brachial plexopathy, known as a stinger or burner, is a common injury in competitive football. Studies have shown lifetime injury incidences from 49% to 65% in college football. Many players will wear a football neck collar to prevent such injuries. A stinger is most likely caused by damaging the upper trunk of the brachial plexus, which is made up of the C5 and C6 nerve roots. This group of nerves runs from the cervical spine through the shoulder and into the upper arm, traveling directly under the clavicle (Figure 1). Stingers usually involve excessive hyperextension or lateral flexion of the head due to an impact, either with another player or with the ground. Symptoms include numbness, pain, or a stinging or burning sensation in the shoulder and arm. Usually, these symptoms resolve within minutes. However, this simple neuropraxia can escalate into an axonotmesis (damage to the axon or myelin sheath) that lasts for days or months, or a neurotmesis (complete disruption of the nerve) that is permanent. Illustrated above is the response of the cervical spine to applied axial load. A, with the neck in neutral alignment, the vertebral column is extended. The compressive force can be dissipated by the spinal musculature and ligaments. B, with the neck in a flexed posture, the spine straightens out and becomes collinear with the axial force. C, at the time of impact, the straightened cervical spine undergoes a rapid deformation and buckles under the compressive load. Severe injuries often result from axial loading injuries. When the neck is flexed 30 degrees from anatomic position, the normal cervical lordosis is straightened and the vertebrae align into a segmented column. An impact to the head will result in a crushing of the vertebrae, with the surrounding soft tissues unable to absorb the impact (Torg, 1990). Such impacts usually result in paralysis or death. During 1971 and 1975, the National Football Head and Neck Injury Registry recorded 259 cervical spine fractures, subluxations, and dislocations in high school and college football. Because of the high incidence of such serious injuries, American football instituted rule changes outlawing head-first tackling, blocking, and spearing in 1976. Since that time, the incidence of severe cervical injuries has plummeted; in 1987, 32 injuries were recorded (Torg, 1990). This injury is still one of concern, but the aforementioned rule changes combined with coach and player education have greatly reduced such injuries. The football neck collars that are worn by football players to prevent this injury were most often designed and put into use without biomechanical testing. Three different football neck collars were evaluated in this set of testing. The first football neck collar tested was the Cowboy Collar, manufactured by McDavid. Its design consists of a molded polyurethane foam collar that gets laced into the shoulder pads. The Cowboy Collar is designed to limit extension of the neck and has the least side protection of any of the collars tested. The second collar tested was the Bullock Collar, which was designed by the Virginia Tech head team physician, Richard Bullock. Its design consists of a high-density foam collar with a rigid plastic insert that is strapped to the shoulder pads. The Bullock Collar is designed to prevent hyperextension of the neck and provides some support on the sides of the neck. The last collar tested was the Kerr Collar, a prototype collar designed by Patrick Kerr. Its design consists of a molded synthetic collar that rests on the shoulders and gets laced into the shoulder pads. The Kerr Football Neck Collar is designed so that the base of the helmet contacts the collar, restricting motion. A series of 48 tests were performed to assess the dynamic biomechanical effects of neck collars currently used in competitive football. Each neck collar was tested at two different impact speeds, at three different impact locations, and two different shoulder pad positions. An instrumented 50th percentile male Hybrid III test dummy was used to assess the effectiveness of various neck protection devices used in football. The dummy was suited with a set of Douglas CP25 shoulder pads and a Riddell VSR4 helmet for all tests. A NOCSAE style pneumatic linear impactor was used to strike the helmet in various locations at several speeds. Control tests were performed in which the dummy was equipped with shoulder pads, a helmet, and no neck collar. Control tests were done for each impact speed and location. Following the control tests, the same tests were repeated with the dummy wearing the various neck collars. The effectiveness of the collars could be determined by comparing the data from the control tests with the data from the collar tests. The Kerr Football Neck Collar and the Bullock Collar consistently lowered head accelerations resulting from a top impact. However, the Kerr Collar produced greater head accelerations reductions. The Kerr Collar also reduced force transmission through the neck. 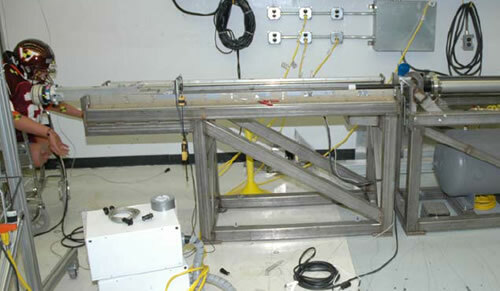 In every testing scenario, the Kerr Collar reduced the most force. The Bullock Collar also performed well, but only in the higher velocity tests. In a top impact, the Kerr Football Neck Collar provided the most protection. The Bullock Collar provided some protection, while the Cowboy Collar did not protect the dummy from experiencing high neck loads. The Kerr Collar reduced the head acceleration and force transmission due to its unique design. The Kerr Collar is designed to contact the base of the helmet during an impact. In a top impact, this redirects some of the load to the shoulders, on which the collar rests. The stiffness of the collar prevents the neck from further compression. Neither the Bullock Collar nor Cowboy Collar prevents the neck from compressing. However, the Bullock Collar was capable of reducing a small portion of the load in some configurations. This is most likely due to the back of the helmet contacting the collar. The Kerr Football Neck Collar also provided the most protection during an impact to the front of the helmet. It reduced upper neck moment and lower neck force in all configurations. The Kerr Collar also reduced the lower neck moment, but only in the raised configuration. Upon inspection of the high speed video, the collar restricts the range of motion of the head and neck by contacting the base of the helmet during the impact. This contact between the helmet and collar is responsible for the lower loads. The Kerr Collar typically performed better in the raised position because it contacts the collar sooner and restricts more motion. This is true for any of the collars in the raised position. The Cowboy Collar and Bullock Collar also provided protection for the dummy throughout the front impacts. The reductions of loads were not as large and consistent as the Kerr Collar, but they were capable of reducing loads in some configurations. In a side impact, none of the collars substantially reduced loads in multiple configurations. Only the Kerr Collar reduced the lower neck moment. Again, this is due to the base of the helmet contacting the collar, restricting the range of motion. This movement restriction is most noticeable in the high speed video. The Cowboy Collar and Bullock Collar provided no side impact protection. Through analyzing this data, it is obvious that the Kerr Collar performs differently than the other collars tested. The Kerr Collar is specifically designed to contact the base of the helmet, which restricts motion of the head and neck. The Cowboy Collar and Bullock Collar are designed to prevent hyperextension of the neck. Therefore, the Cowboy Collar and Bullock Collar only reduce loads in front impacts. Restriction of motion correlates with load reductions for each of the collars. In the future, manufacturers should consider restricting the motion of the head and neck in more orientations than just hyperextension when designing collars. This restriction of motion should lead toward distributing loads to the shoulders, rather than the head and neck. Each neck collar was tested at two different impact speeds, at three different impact locations, and two different shoulder pad positions. With the top impact location, it was found that the Kerr Football Neck Collar and Bullock Collar reduced head accelerations and force transmission through the neck, with the Kerr Collar producing greater reductions in force transmission. The Cowboy Collar produced no reductions in a top impact. With the front impact location, all the collars reduced lower neck moment, while the Kerr Collar was also capable of reducing the lower neck force and upper neck moment. With the side impact location, the Kerr Football Neck Collar produced the greatest lower neck moment reductions. You can read the full report prepared by Virginia Tech’s Wake Forest Center for Injury Biomechanics. Click link below.